Whether referred to as a four-legged companion, fur baby, best friend, or beloved pet it’s a beautiful thing for a dog and/or cat to find their forever home and All About Dogs and Cats is dedicated to maintaining the health and happiness of local Ham Lake, Andover, Blaine, Oak Grove and East Bethel MN pets and their parents. Keep your pet beautiful with our grooming services, satisfied and strong with our quality food selection, feeling loved and adored with our delicious and healthy treat variety and accessories. We make all of the above easy to do because our store offers unmatched services, only the best brands, we are stocked with some on the most unique accessories and everything is at competitively low prices. Our professional pet bathers and stylists have the ability to comply with just about any grooming requests. Your pet is our number one concern, every service we complete will be with your pets comfort in mind. 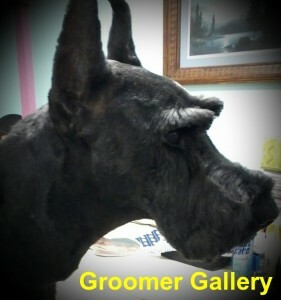 When you choose our grooming services your animal may just be happy to get out of the house and into a new style. 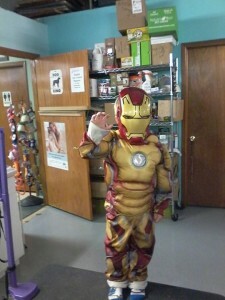 Our selection of pet products is second to non and we guarantee to meet or beat any of our local competitors. The style of grooming we offer is only holistic, this is what our team has been dedicated to their entire careers. This dog and cat grooming style is focused on gentle touch, which gives us the ability to read the animal’s body language and ensure they are as comfortable as possible. With this grooming method we are also able to tailor to your pet’s specific and individual needs. Positive reinforcement, also known as praise is the primary tool we used in our holistic grooming process. The shampoo and conditioner we use for each and every pet (unless you request your own) is holistic too; meaning no added dyes, fillers or unnatural preservatives. The brand we use is Quadruped and we also sell their products in our store. We treat your four-legged babies as if they were our own and will only use safe, gentle and beneficial products and grooming techniques on them. Whether you’re certain of your pets exact grooming needs or you’re new to the whole pet parent life – we are here and are passionate about giving your pet exactly what they need, no more, no less. 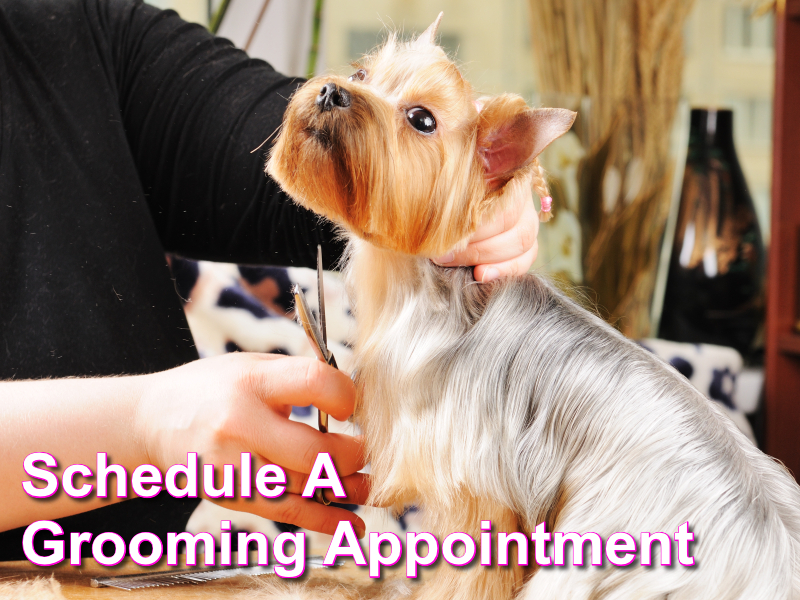 Stop by and ask for our professional grooming opinion about the specific services your dog or cat would benefit from. Our caring and holistic trained groomers are dedicated to the health and happiness of your pet and provide you with satisfaction and personalization that other, bigger grooming companies can’t. 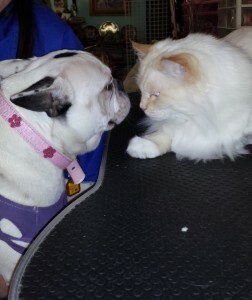 We service and supply dogs and cats located in Ham Lake, East Bethel, Andover, Isanti, Blaine MN and surrounding areas. 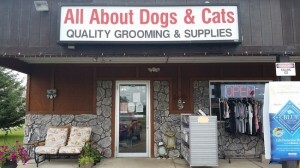 Contact our gentle and friendly staff at All About Dogs and Cats for answers to any questions or to set up a personalized grooming session for your four-legged family member today at 763-434-2555. 2 legged & 4 legged kids Welcome! WITH Chances to spin the Prize Wheel!